If you prefer watching a video, learn here in less than 2 minutes what dein-Rennpferd.de is and how you can become a racehorse owner with the help of our website. Why should I share in a racehorse? What happens when the „start fee“ of your racehorse is reached? What happens when the „start fee“ of your racehorse is not reached? How much does the use of dein-Rennpferd.de cost? How do I open an account on dein-Rennpferd.de? How do I become a racehorse owner? Who can invest in a racehorse? Which payment options are available on dein-Rennpferd.de? Which risks are there when investing in a racehorse? Are the names of the racing stable members published on dein-Rennpferd.de Homepage? Can I ask questions to the trainers, the offering racing stables or dein- Rennpferd.de? What are the subsistence costs for a racehorse? What are the regulations of the German racing order concerning race winnings? How often will your racehorse run in one season? In which way will a racehorse be sold? What are the prices for races? What are benefits from a Crowdfunding for racing stables and their new shareholder? Who can realise the dream of owning a racehorse with dein-Rennpferd.de? Can I invest from abroad? Can I also give my share away? Can I also sell my shares in racehorses? What will happen after the expiration of the minimum sharing period in the racehorse? When are winnings from shares distributed? How many different types of shares are offered on dein-Rennpferd.de? Can I visit racehorses before buying shares? Dein-Rennpferd.de is an Affiliate Marketing partner of German horse racing and the horse racing platform for bettors and horse enthusiasts. Everyone can share in racehorses via the Crowdfunding principle easily and without sequential costs and benefit with some luck from race winnings and sale proceeds and, of course, experience great moments with his or her new racing stable friends on the racecourse. Owning a racehorse is connected with high fixed and purchase costs. Furthermore, unforeseeable costs for veterinarian, transport and so on can arise; not to forget high personal effort for the organisation. The dream of an own racehorse: racehorse shares from 100 €, one-off payment, no running costs, no obligations. Dein-Rennpferd.de is no horse racing club: You own a real share in a racehorse and benefit from possible race winnings and sale proceeds. You are always close to your racehorse: News, videos, training and race visits. You are part of a great community: Meet friends and find friends on the racecourse. A great gift: Shares in racehorses will astonish the donees. First of all, the joy and the great experience of owning a racehorse and being thrilled by it in the community during training and races should take the centre stage. It has never been so easy to make real the dream of an own horse without running costs and expenditure of time. There is, of course, the chance to call an above-average racehorse its own and to benefit from race winnings and/or sale proceeds or to immortalise in almost 200 years old winners’ lists. Dein-Rennpferd.de enables the possibility to share in racehorses and their racing stables via the Crowdfunding principle. Thus, dein-Rennpferd.de and also trainers next year, other owner communities/racing stables or individual racehorse owners who look for race horse enthusiasts present their racehorse and the aims of their racing stables with the intention to find new supporters and investors and to get them interested in the horse racing. The start fee: Every racehorse provider looking for racehorse enthusiasts for its racing stable firstly determines an amount, the so-called “start fee”, which is necessary for running a common racing stable for a fixed time. The start fee consists of the value of the racehorse, training and sustentation, health-care costs, blacksmith costs, transport costs to the races and fees for information, registration and federation. Furthermore, the provider determines a minimum sharing period per new racehorse investor. The description of the racehorse, the trainer and the strategy of the racing stable: The individual racehorse is comprehensively described, the trainer and the location of the horse are published and the strategy of the racing stable is explained. From the start it is given how the horse shall run for the racing stable and how long it will take part in races until it will be sold or changes the breed and/or it will be decided. The rewards: Several providers will offer additional rewards for the new racing stable members, except the proportional race winnings and sale proceeds. Such as regular training visits, merchandising products or special grants on the racecourse. All these possible rewards are listed for racing stable members before they invest in a racehorse. Then, a 60-days promotion period starts in which the racehorse and the racing stable are advertised on the website and via social media channels. If the necessary start fee is reached by different investors and racehorse enthusiasts or the provider decides to take over the racehorse even if the start fee is not completely reached at the end of the Crowdfuning period, the project is successfully completed. When the start fee is reached, the fun can start. You are now racehorse owner and you will look forward excitedly to the first start of your racehorse. Moreover, you will be sent the contract documents in digital form. From this moment, reporting of your racehorse will start on dein-Rennpferd.de. You will also be informed about all already known race dates of your racehorse and possible trainings visits and events. 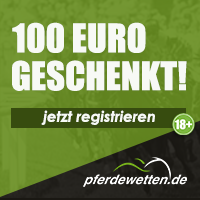 There are racehorses on offer on dein-Rennpferd.de which start off independently of the reached start fee amount. Other racehorses only start off when a determined start fee threshold is exceeded. There are two options when the start fee is not reached. Firstly, the provider of the racehorse bears the rest of the start fee and your horse will start off as soon as possible. Secondly, dein-Rennpferd will unfortunately not pursue a career with you. In this case, you get your possibly paid money back. You have, of course, the possibility to invest in another racehorse. Registration and use of the site are for free. If the dein-Rennpferd.de racing stable offers an investment in a racehorse and a membership in its racing stable, the new racehorse owner pays his/her one-time amount. After an successful sale of the horse, dein-Reinpferd.de holds a 5-percent service fee of the sales amount of the horse after deduction of all costs. The conditions of the providers will be presented here from Automn 2015. It is easy to register on dein-Rennpferd.de. You sign in with your Facebook account via the login field in the upper right-hand corner of the dein-Rennpferd.de site. If you don’t have a Facebook account, click on “Login” in the upper right-hand corner to sign in manually. After that, you should confirm your user data and e-mail address and carefully read an information document concerning “investment in racehorses” before becoming a racehorse owner. As soon as you found a racehorse you are interested in or a racing stable in which you want to be involved, click on it and put in your share to the start fee in the corresponding box. Then, you confirm your contribution to the start fee with a click of the button “invest”. Congratulations, now you are racehorse owner, participate in the race winnings and/or the sale proceeds and you will be kept up-to-date with news, videos and videos concerning the development of your racehorse. You are part of a great community and get into the adventure of horse racing. You must be 18 at least to share in a racehorse. You pay conveniently via Paypal or bank transfer, directly after you decided for dein-Rennpferd and got your invoice. Primarily, you should invest in racehorses with fun and joy. You should share to experience unforgettable and exciting hours on the racecourse with friends. An investment in racehorses should not be considered as store of value. Racehorses are living beings and no machines. Therefore, racehorses can unexpectedly become ill, get injured or die. But racehorses are especially a big source of happiness and a great hobby. But sometimes also a very rewarding investment. Talking with like-minded horse racing enthusiasts and meeting them personally on the racecourse or at training, above all, sign the incentive of participating on dein-Rennpferd. Nevertheless, there is the option to make himself/herself and his/her investments anonymous on the site. In many cases, the individual racing stable awards so-called “rewards” to their new members as sign of gratitude. On the one hand to thank the new racing stable member and on the other hand to provide further incentives to invest in a racehorse. In the individual start fee funding field of the racehorse, you can see which “rewards” are awarded. The sustention of a racehorse is composed of fixed and running costs. Blacksmith, training and subsistence costs and insurance policies belong to the fixed costs. Transport fees, costs for veterinarian, entry fees, costs for the equipment, registration fees and purchase costs belong to the running costs. Keeping an active racehorse costs between 17,000 € à 30,000 € p. a. in Germany. Depending on trainer, races, transport and health. „Beginners“ should know the following concerning race winnings on German and international racecourses: The trainer basically holds a 10-percent share at the prize exchange and the Jockey holds a 5-precent share. The residual winning is distributed on a pro rata basis. It is comparable to athletes and individually different. At first, the health of the racehorse plays a decisive role. After that, parameters like the offer of races and the season planning of the trainer can be considered. Following basically applies: A racehorse needs 3-4 weeks regeneration after a race. If your racehorse is healthy, it will run as soon as possible. Prices for races differ substantially from racing class to racing class and from country to country. Small races are in average endowed with 5,000 € - races at price of 10,000,000 € in Dubai are at the top. You are beginners in horse racing and can hardly wait to own a racehorse? In this sector, we answer the most frequently asked questions concerning horse racing. Just send your questions to info@dein-Rennpferd.de. Crowdfunding is a topical issue. But what does it mean at all and how do horse racing and racing stables or racehorse owners benefit from it? For new racehorse owners: no running costs. Everyone can share in racehorse with an amount suiting to him/her. The amount is a one-off payment and then the owner can be devoted to the racehorse. A wide choice of racehorses: It is possible for every racehorse enthusiasts to share in multiple racehorses and thus to distribute the chances of success and also risks to many racehorses. Convenient and simple: The racehorse owner can concentrate on that what is the most fun for him/her. Watching his/her racehorse and being thrilled by it. Dein-Rennpferd.de takes care of paperwork and all the other obligations concerning administration, organization and information. Independence: It’s like football. If you are displeased with the team, you look for new players or a new trainer. The shorter periods of time enable to get your favourites in your racing stable from season to season. 5. Information, entertainment, benefits: Dein-Rennpferd regularly provides entertainment and information about your racehorse. Even if the way to the racing stable or the racecourse is too long, you are very close to your racehorses. Thanks to the cooperation with the horse betting providers, you can look forward to many benefits and bonuses, such as competitions, vouchers and bonuses for your betting account. Nobody is perfect. This also applies for a start-up like dein-Rennpferd.de. We permanently develop our website with the aim of making the hobby of racehorse enthusiasts and people who are interested in racehorse as convenient and as easy as can be for them. The question is not about the income, it’s much more the question of legal age to share in a racehorse. Students can as well as successful businessmen invest in a racehorse. If just for fun or with ambitious derby plans in mind, everyone can join dein-Rennpferd.de because there is no need for a minimum sharing amount for many horses. You share in during the season as a lessee of a racehorse. I. e. that dein-Rennpferd.de as lessor takes care for all tasks concerning your racehorse. From veterinarian, blacksmith, dentist to the trainer. From the organisation, the registration for races to the distribution of winnings and possible sale modalities, you don’t need to take care. There is also no risk of liability, neither for unforeseeable veterinarian costs nor for damages caused by the racehorse. Yes, that’s possible. Also racehorse enthusiasts outside of Germany can invest on dein-Rennpferd.de. We offer several payment methods which are also abroad available. Yes, that’s possible. Therefore, there are dein-Rennpferd.de vouchers. You can give shares in racehorses away with the dein-Rennpferd.de vouchers. These vouchers are not only the most unusual present you have ever made but also the donee can’t stop being astonished. After termination of the contract and an agreed sale, dein-Rennpferd takes care for the sale of the racehorse. During the contract period, you can’t sell your shares in racehorse within one season. If there is an option in the contract to extend the contract period, there will be a voting among the shareholders after the minimum sharing period is elapsed. Otherwise the racehorse will be prepared for the sale. The voting weight corresponds to the percentage proportions. If more than 80 % of the shareholders decided for keeping the racehorse, the shares of the owners who want to step out will be sold to the remaining shareholders. Should it not work or less than 80 % want to keep the horse for a further season, the horse will be sold. In case of an agreement, the share price to be paid for keeping the horse in the new season will be charged to the account of every shareholder. Race winnings are credited at the end of a season on the so-called "payday" which is fixed before the start of the season. When answering our mail you can inform us about the way of receiving your proportional race winnings. The mail simultaneously serves as voting whether your racehorse shall keep on training or shall be sold. The mail confirms your pre-emption right. In case of selling your racehorse, your proportional sale proceeds will immediately be transferred to your account. Basically, two types of shares are distinguished. In the first case, every racehorse enthusiast has a holding in race winnings and sale proceeds. This variant is suitable for all racehorse enthusiasts who speculate that the racehorse will be sold at a profit. The second variant is excellently suitable for beginners in horse racing who received a racehorse voucher or would like to redeem a voucher of a betting provider. With this variant, the racehorse owner has "only" a holding in race winnings but often receives more shares in a racehorse for less money. Every offer on dein-Rennpferd.de is clearly marked so that you can easily see whether you get shares in the whole racehorse (value of the racehorse + race winnings) or you exclusively have a holding in race winnings. Whichever option you select, you will always feel close to your racehorse with the help of news, information and visits at trainings or race days and you will become racehorse owner. Of course. The visitation is possible on dates which are announced on the site.